ANIMALS ARE OUR WISE FRIENDS AND TEACHERS: Open to their wisdom through meditation in these special and unique classes. Do you instantly soften and relax when you spend time with animals? This is because an animals heart connection is SO powerful that it effortlessly draws you into the same space, connecting you to the gentleness of your own heart… without a word. Let the animals teach you how to let go of your worries and begin to honour (and heal) your heart; as you learn how to share meditation with the animals in your life, in a nurturing and supportive environment. Whether you wish to connect with animals that are big or small, domestic or wild, the approach and tools you will learn apply to ALL animals! The animals (my wise and gentle co-teachers) & I are excited to have you join us! “Fascinating and enlightening practices taught/ shown in this workshop. The solution is so simple all you need to do is let go and see with your heart. Carolyn has a great way of guiding you to truly and fully connect.” Jon. SUITS: All animal lovers, whether you have experience with meditation or not! WHEN: Sunday 29th October and Sunday 5th of November 2017 – 12.30- 4.30 PM (BOTH DAYS). 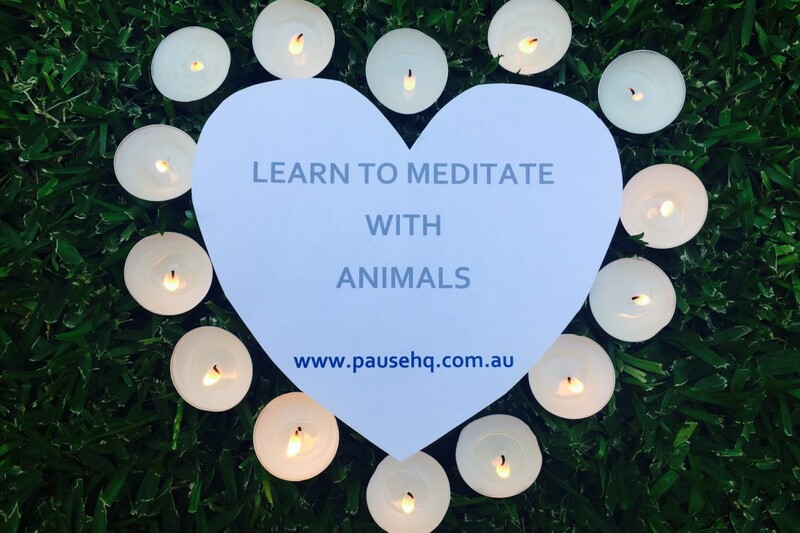 WHY: Meditation is fantastic for stress relief & sharing meditation with animals is a beautiful way to strengthen and honour the deep bond you share with the precious animals in your life. – MEDITATION TUITION & PRACTICE: 8 HOURS. (Course delivered over 2 half days- Sunday afternoon x 2 weeks. You will learn & practice 5+ different meditations). – LOTS OF TIME FOR Q&A. (Including in week 2 after you have had a chance to practice with your own – or your friends, or native animals – in between classes). – AFTERNOON TEA BOTH DAYS: (includes vegan and gluten free options + tea/ coffee & herbal teas). – CERTIFICATE OF ATTENDANCE + 25% OF COURSE IS FEE DONATED TO CAT HAVEN! Q1: I ONLY HAVE A DOG, DO YOU RUN THIS COURSE AT A DOG SHELTER? A: Not currently. However – the approach you will learn in the course is exactly the same: whether you meditate with a dog, cat, rabbit, horse – or any animal! Plus, you’ll have time to practice with your dog at home, in between the 2 classes and to ask questions throughout the course. Come along, learn with the cats, then take that knowledge home to your beautiful dog! Q2: I’M ALLERGIC TO CATS! BUT I WANT TO LEARN TO HELP MY BIRD. A: Oh No! You might like to instead book an Animal Reiki session where I visit you and your bird in the comfort of your home. As part of the session (allow 1 hour for the first session) I can teach you a meditation and we can meditate together, with your bird. Otherwise, you can wait for future courses (like Animal Reiki Level 1/ Shoden) at other locations, however this course will be more expensive (and intensive) than the 5 Meditations Course. Q3: I CANT MAKE BOTH DAYS, CAN I BOOK FOR 1 DAY ONLY & PAY HALF PRICE? A: Unfortunately not. To get the most benefit (for yourself and your animals!) you’ll need to attend both days. The course will run again in 2018. If you join the Pause mailing list (link at the bottom of this page- you’ll also score a free E-book!) and/OR like the Pause Facebook page (@Pause HQ or www.facebook.com/PauseHQ) – you’ll be the first to know when new dates are announced. CLAIM your FREE copy of the PAUSE people animals wellness E-book ‘TOP FIVE THINGS YOUR ANIMAL FRIENDS WANT YOU TO KNOW’ HERE!